The chainsaw is one of the most common, and handy tool used by construction workers, consumers, landscapers, and loggers in the world today. It is mainly used to help tackle large tree-cutting and home improvement jobs efficiently and safely. Follow these 9 tips on chainsaw safety. Although a handy tool, the chainsaw is quite powerful and can pose a huge risk if mishandled. It would therefore be best if you could learn how to handle it correctly and safely to avoid getting injured or injuring people around you. Discussed below are 9 tips on how to use a chainsaw efficiently and safely. Although it may sound cliché, reading the instruction manual that came with the chainsaw could save you lots of trouble when using it. These manuals have everything you need to know from handling it, servicing, modes, and components inside. Be sure to read every bit of the instruction manual upon purchasing any mechanical machinery. If you however owned or used a chainsaw before, don’t assume that a new one will work the same way. Some may have additional controls or operational modes you may not be accustomed to. Take some time to go through the instruction manual to see if there’s something new. This won’t take much of your time either. Do not toss the manual yet, keep it in a safe place – in case you need it in the future. The chainsaw is one of the most powerful equipment’s available over the counter. If you don’t get anywhere with the instruction manual, seeking initial in-person training/instructions could help. 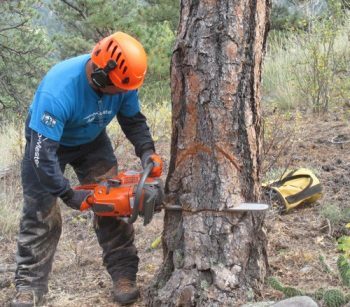 Having someone help you understand how to operate the machinery, how it should be handled, and other modes of operation could help you get used to to the chainsaw pretty fast. You could also take advantage of video tutorials on how to use the product too. You may need a moment or two before you can fully understand how the chainsaw works. Some patience is therefore required to get past the initial nuances that come while on the field. Spending some time with the equipment also helps you learn how to handle it correctly too. Chainsaws cut through timber and wood at incredible speeds. The chain itself is like a double-edged sword, hence should be handled with lots of caution and care. Debris produced by the rolling chain as it cuts through wood can also be massive and tossed at high speeds as well. It’s therefore advisable to take the necessary safety measures (wear protective equipment, goggles, and aprons) when using this equipment. You will also need chainsaw chaps and a helmet when cutting down trees using a chainsaw. Chainsaw chaps protect the consumer from accidental ‘kickback’ from the chainsaw and other debris produced by the rolling blades. It would also be wise to use the chainsaw away from children, pets, and civilians. In addition to paying attention to safety, it’s advisable that you set up a work station or designated space. Have a radius set where only you or an assistant is allowed to cross. This is particularly important when working with pre-fabricated construction materials or lumber. It’s by demarcating your workspace that people around can be assured of safety, especially from flying debris or falling trees. Setting up a workstation also allows you peace of mind, and space to put down the chainsaw when taking a break or need to work with other tools. Although it may seem obvious, setting up a workstation could save you lots of pain should an accident happen. 1. Do I have an escape route when the tree starts falling? 2. Does the tree have a clear path for the fall? 3. What are the consequences of the tree falling in an unintended direction? 4. Are there structures, people, or animals close-by? Be sure to double-check everything before starting the chainsaw. Check the surrounding, controls, bar, handle, the sharpness of the chain, and its tension. If anything seems amiss, it probably is. Have it checked to ensure it doesn’t affect the equipment’s mode of operation and safety. In the same way, you would check your motorcycle or car, check to ensure the oil and gas reservoirs are properly filled. Ensure there’s enough gas (especially when working on a big project), as well as the oil for lubrication. Lack of adequate lubrication could lead to friction, hence production of heat which could damage the chainsaw. As a safety measure, only start the chainsaw while on a flat, even surface. As mentioned earlier, a chainsaw is quite powerful. Starting it for the first time on an uneven surface can put you out of balance. Consult the instruction manual if having trouble starting it up. It’s vital to ensure the chain brake is engaged and the choke closed before stitching the engine on. Common sense is needed when operating a chainsaw. For instance, you need to establish good footing and balance before starting the engine, and when using the saw. Maintaining good footing eliminates chances of tripping with the chainsaw rolling. You also should operate the chainsaw while intoxicated, drunk, or overwhelmed with fatigue. For maximum performance, keep your hand firmly on the front handle, and use your thumb for support. Clean and store the chainsaw in a safe place once done using it. It should also be kept away from any child’s reach. If possible, invest in an industrial storage locker capable of protecting it from dirt, dust, and moisture. 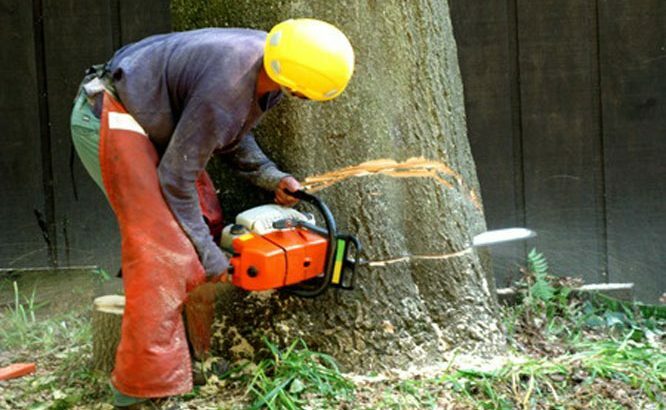 Exposure to some of these environmental factors could damage your chainsaw. I wonder how many of us really take training lessons before using a chainsaw. It seems so simple from the outside but boy can you get it wrong if you don’t know what you’re doing. I’m so glad I took some lessons – I now feel much more comfortable using my chainsaw. Is Burning Wood Cost Efficient?